A mom, Penny Rohleder has shared a hilarious photo of herself, drawn by her 5-year-old son Julian. 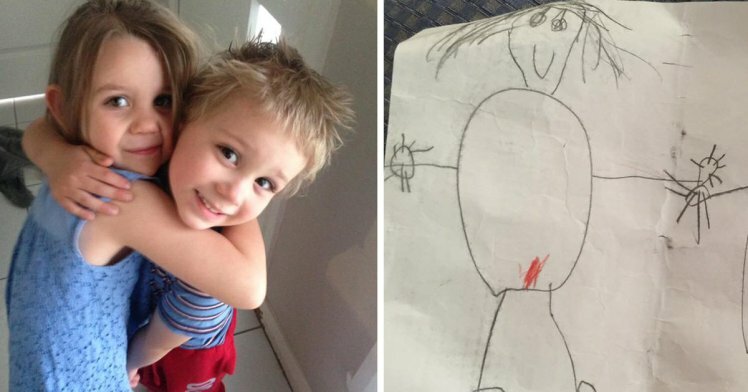 The picture is the cutest most innocent thing ever, only that the picture shows Penny having her period. The picture however didn't seem to go down well with everyone, as some of the commentators berated her for sharing something so private online. 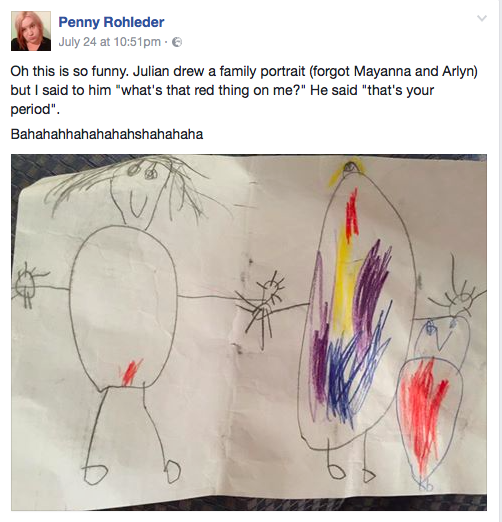 I shared it because it was funny, but I was also proud that my 5 year old knows what a period is, when some fully grown men do not. It’s such a taboo subject for many adults, especially men. Women too, are embarrassed about their bodies and I have absolutely no idea why. If that’s the case, then we should be giving women a week off work every month, because I hate to break it to some of these people, but women bleed every month. That woman sitting next to you on the train? She’s having a period this month. ‘She might even have it now. It’s not an “unsafe” topic, it’s a normal bodily function that women shouldn’t be made to feel embarrassed about. In saying that, I’m not one of the women who openly shout “I HAVE MY PERIOD” every month, but when a child knows that their mother gets her period occasionally, that’s not a cause for uproar or concern that I’m too open with my kids.